I think you should have a good look. Congratulations to all who do Silent Hunter may continue to exist and fascinate many people. 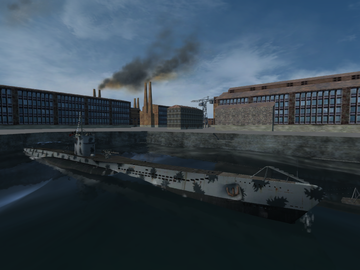 NYGM Tonnage War Mod - More than a mod: it's an experience! Моя игра SHIII_GWX_Reworked_Rus перезалито 24.11.16г. Last edited by Anvar1061; 11-25-2016 at 01:32 AM. So file .001 is meant too have an error ??? , or will this error affect in install of this mod . There is no mention of this error in the read file`s , only that it may take up too 15 to 40 min to load up , [ life`s too short for a 40 min loading time ]. OK , always get file error on 7zip when extracting somewhere . But when test & extract , get no error! . 3: copy JSGME from SH3_GWX3.0_REWORKED_RUS folder to SH3 folder & run to setup MODS folder. 5: Run in JSGME . 6: Start SH3 as normal , [ long time to load ]. 6. In the root folder MultiSH3 run and enter the name of the folder to save (other than SH3). 7. There you select the required HsieOptionsSelector_V16B function. Long time to load-the game is not for children!!! doing this ,[ like the heavy metal music intro ]. as the file unzipped file size is not the same ? . [ no firewall - browser : seamonkey (pause & resume at end of download). The current version on my Mediafire! Last edited by Anvar1061; 11-25-2016 at 01:33 AM. I dont really get it , since i dont understand Russian. Can anybody explain me what this mod is about , or what is the aim of the mod? It obviously wants to "improve" GWX but what is different to GWX Gold 3.0? Last edited by SnipersHunter; 10-12-2016 at 04:29 AM. - How to install the game? - The best way through JSGME. To this end, it set a new SH3 v.1.4b. The downloaded and decompressed SHIII_GWX_Reworked_Rus throws in the MODS folder and rolls. All. In the root folder MultiSH3 run and enter the name of the folder to save (other than SH3). There you select the required HsieOptionsSelector_V16A function. Start the game with the patched EXE and make necessary adjustments. Exit the game. For SH3 Commandera specify the path to SH3.exe. We set up for themselves. All. Play through SH3 Commander!!! The MODS folder, new files. Unpack and read Documentation. 10th Flotilla. In France until the End. I express my gratitude to all comrades, one way or another, participated in the creation of the game! Last edited by Anvar1061; 11-17-2016 at 08:09 AM.